I couldn’t sleep last night. I’m not sure what my deal was but it made for a challenging morning when I had to pull myself together and do an interview across town. Thankfully, the subject was art and craft and I was fully engaged. With that said, I headed straight back up to bed as soon as I returned home. I didn’t really sleep on my second attempt, but I did close my eyes for a bit and that counts for something. Then I got bold (crazy?) and laced up my shoes and went out for a run in the snow and ice. I did not have much left to give today so it was a slow run. I was tired when I laced up, but I ran anyway because I’m working hard to kickstart a new training plan and hoping to sleep very well tonight. I also started using a Fitbit pedometer today. It was a Christmas present from my husband and it’s a pretty neat litte device. While my Garmin watch with GPS (my favorite nerdy running gadget) charted the run at 4.25 miles, the Fitbit credited me for about a mile more. While the mileage measurement was not accurate, the Fitbit did inspire me to go up and down my stairs an extra 25 times after I put the kids to bed so I could earn my “50-floor” badge. I checked the device before each assent to make sure I was getting credit for my impromptu cardio experiment and it accurately counted my 25 trips up the stairs. 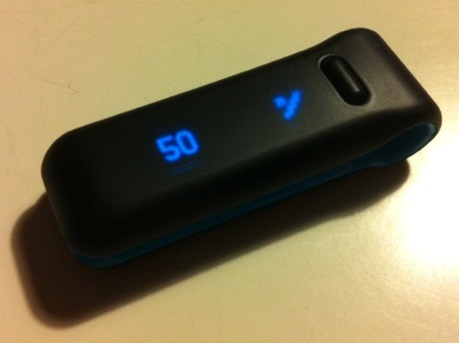 The FitBit isn’t perfect, but it better than every other pedometer I’ve tried so far. So I’m planning to keep it around and run another mileage test. The device also measures sleep quality, which is a feature that I’m going to test out tonight. As I struggle to stay awake to complete this post I’m thanking my lucky stars that I didn’t go nuts and try to earn more calorie burning badges. Tomorrow is another day and I really hope I’m feeling refreshed by then. Let’s try this again tomorrow.